Kuala Lumpur has a new logo and tagline to promote tourism! it looks like it’s drawing online criticism from Malaysians, who are poking fun at the design and the words used to describe their beloved capital city. 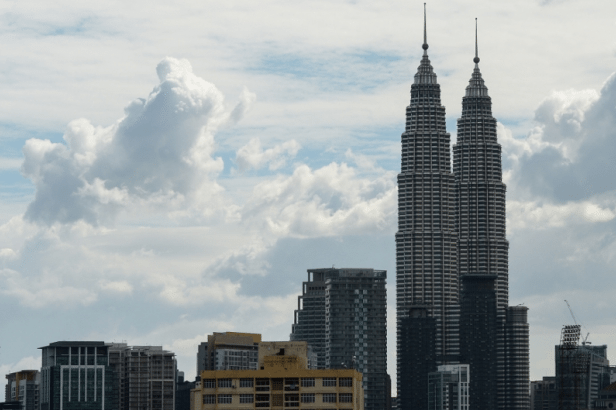 The logo, a simple design featuring “Kuala Lumpur” written in grey lettering with a drop shadow, describes the city as “exciting, surprising and enticing”, and also brands it as a “city of contrasts and diversity”. According to reports, it was unveiled on Monday by Mayor Datuk Seri Mhd Amin Nordin Abd Aziz. Internet users were quick to mock the city’s new tourism promotion initiative. “We can’t do this to our city. Please don’t,” wrote Wahida Y. A Twitter user, Iced Nyior, recreated a similar logo with WordArt and posted it online, claiming it only took her five minutes to complete it. 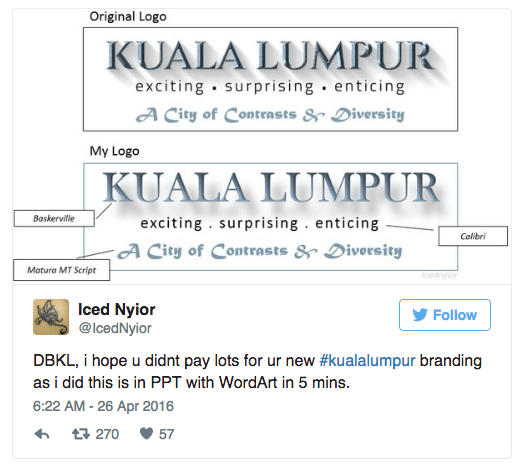 “DBKL, I hope you didn’t pay lots for your new #kualalumpur branding as I did this in PPT with WordArt in 5 minutes,” the user wrote. The Star in its article this week quoted Amin as saying that Kuala Lumpur needed its own branding in the same way Paris is associated with romance and Rio de Janeiro is associated with a carnival atmosphere. “We need to create a brand for Kuala Lumpur, something that differentiates us from other cities,” he was quoted saying.